1. During which month do four wolves hunt in the rain? 2. 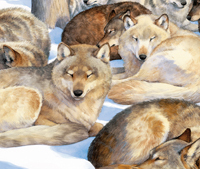 During which month do six wolves nap in a warm meadow? 3. During which month do eight wolves dance in the twilight? 4. During which month do ten wolves chase moose? 5. During which month do twelve wolves sing in the woods on a winter night? 6. During which month does one wolf howl in the moonlight? 7. During which month do three wolves bark with humans in sight? 8. During which month do five wolves peek at the bright sunlight? 9. During what season are the pups born? 10. 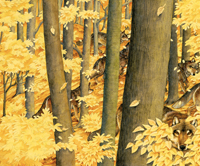 During what season do the wolves hide in the falling leaves?